Following on from this morning’s space theme, a reminder for New Zealanders and Australians to pencil the late evening of June 26th into their diaries. For New Zealanders, the partial lunar eclipse will occur from approximately 10:30pm until 12:30am. The midpoint of the eclipse should be at 11:38pm. For a full list of eclipses this year, and if you can see them from New Zealand, check the Eclipses in 2010 page of the Royal Astronomy Society of New Zealand website. Can you explain why there is always a full moon during a solar eclipse? Why does the moon not go completely dark during an eclipse? Why are (parts of) the shadow on the moon slightly red? Solar and lunar eclipses are familiar to most people, but can stars eclipse eachother? What culture deduced that the earth was round (spherical) by observing the shadow of the earth on the moon? Could the shadow of the earth on the moon be used to work out the distance between the earth and the moon, the size of the moon and how? Offer your answers in the comments. (Or in a blog post, if you’re so inclined.) Try answer them yourself before searching the internet if you can. I may hold the answers up for a day (or two) to avoid spoilers for those still wanting to challenge themselves. Not a quiz question, but something I’d like to know. Matariki* festivities start today (June 14th running until July th). Are there any Maori stories related to lunar eclipses occurring during Matariki? 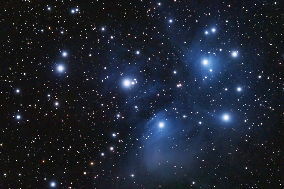 * For those outside New Zealand, Matariki marks the Maori New Year, marked by the rise of the Pleiades, aka Matariki. Some celebrate with the full moon, which in this case will be eclipsed. ** It’s worth seeing the full-resolution image (651Kb), it’s a great shot of the night sky. If the eclipse lasts 2 hours, shouldn’t the mid-point be around 1 hour in at 11.38, rather than 10.38? Whoops 🙂 Thanks for that. Anyone interested in dinner somewhere just after 8pm? Any suggestions of somewhere to eat that will have a good view of the sky? Any suggestions of somewhere to eat that will have a good view of the sky? Iâ€™m not much help with the Wellington scene Iâ€™m afraid… Any Wellingtonians with ideas…? We need a big high like the one coming up in the next few days. 1. 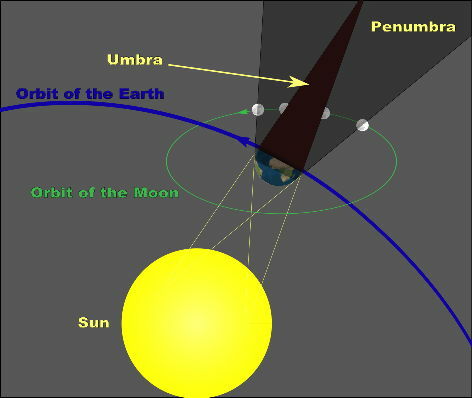 A lunar eclipse can only happen when the Moon is in opposition to the Sun and when in opposition it is a full moon. 3. Syzygy is an alignment of 3 bodies. In this case, the Sun, Earth and Moon. 4. At a guess I’d say it has something to do with the refraction of light through the Earths atmosphere scattering light into the umbra. 5. Another guess, I’d say it has something to do with the light being filtered by the atmosphere. um… also, do you mean 12.30 am i.e. midnight? 1. Use google (bing, Yahoo, etc.) if you need to, just let us know if you do. @Claire, Heh. Would love to see a lunar eclipse at midday (the only other option available to your question). The implications would be entertaining. We’d need to be in a binary star system wouldn’t we? For those coming here expecting something about tonight’s eclipse, my apologies. I did mean to write something but big winds in Dunedin have brought down trees including a larger Kowhai on my section which I am dealing with. (Sawing it up, etc.) Pity to lose it too.